Clients enjoy our personalized attention, easy accessibility and over seventy years of combined legal experience. Kamine & Schilling, LLC is situated in the Montgomery area of Greater Cincinnati and serves clients throughout Southwestern Ohio. Attorneys Charles Kamine and Ronald Schilling have each been practicing law for over 37 years. They are highly respected among other attorneys. Peer Review rated by Martindale Hubbell, Charles Kamine and Ronald Schilling are recognized for their level of competence, high ethical standards and accomplishments in the legal arena. We offer a full range of estate planning and estate administration services from initial planning through filing tax returns and administrating decedents' trusts and probate estates. We counsel clients in corporate and small business matters as well as real estate and taxation, with goals of increasing bottom lines and securing financial legacies. A significant number of our clients are referred to us by other attorneys and also by satisfied clients. When clients call our firm, they are granted easy accessibility to the lawyers and receive personalized attention, speaking directly with the attorneys rather than being referred to paralegals. We offer legal advice in a friendly yet professional atmosphere. Clients look to us for effective planning and innovative solutions for their estate, trust, business and tax issues. Our Attorneys We take an active role and are well reputed in the community. Serving for six years as the Mayor of Amberley Village, Charles Kamine also served twelve years on the Amberley Village Council and twenty years on the Amberley Village Planning Commission and Board of Zoning Appeals, where he was also the Chair. Early on in his career Charles Kamine became involved in probate work and handles will contests, heirship suits, and administration of estates. He has been a speaker at the Practical Law Institute at the Cincinnati Bar in the area of Probate. He has also taught courses in real estate to realtors and other lawyers. After graduating from law school, Ron Schilling worked for Fifth Third Bank in its trust department as estate tax administrator and trust officer until 1981. He has taught the Gift and Estate Tax course at the University of Cincinnati College of Law, and tax procedure and real estate law for the University of Cincinnati Continuing Education Program. 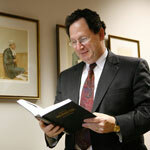 The focus of his practice in estate planning involves wills, trusts, estates, Taxes and related issues. Ron is a Co-Founder and Director of The Schilling School for Gifted Children, a small non-profit school incorporated under Ohio law and exempt from tax under the Internal Revenue Code. Charles also serves as Director of the school, which has been in operation for more than ten years. Our attorneys, Chuck Kamine and Ron Schilling, look forward to providing clients with legal assistance. To arrange a consultation to learn about revocable vs. irrevocable trusts, living wills, powers of attorney and other estate administration concerns, please contact us our office by phone at 513-721-6151. A will is a legal document that provides how possessions, assets, accounts, securities, claims and other property in your name will be distributed after death. A properly drafted will can minimize estate administration expenses. The will may direct distribution of property to a spouse, to children, or to other heirs, after payment of legally enforceable debts, expenses and taxes. A pour over will may distribute property to a trust. A will may also appoint a family member, friend or institution as Executor, or personal representative, to carry out the terms of the will in accordance with the controlling law. A will may also designate a guardian for dependents. Depending upon a client's objectives and upon the financial structure and size of the estate, a trust may be appropriate to safeguard the value of inheritances and minimize taxation. A trust allows one individual to hold property for the benefit of another. There are many different types of trusts designed for wealth management, and trusts cover a variety of financial circumstances. Some estate planning avoids probate by passing assets outside of probate, often minimizing costs and retaining value. We employ gifting, succession planning and other estate tax planning when it will benefit our clients and further their objectives. At Kamine & Schilling, LLC, we will review your estate, weigh the advantages and expenses involved, and assist you in determining and implementing an effective plan. Clients who are aging or who have aging parents may need to make arrangements for future healthcare and assign responsible parties to manage affairs. We offer legal services such as living wills, advance directives for healthcare, durable powers of attorney and other powers of attorney. Each person's estate and financial situation is unique, which is why it is vital to obtain an experienced estate planning attorney who will take the time to thoroughly review your assets and financial circumstances and arrive at an effective estate plan that suits your particular needs. Membership: Cincinnati Bar Association (Former Chair, Real Property Law and Grievance Committees and Young Lawyers Section); Ohio State Bar Association (Member, Estate Planning, Trust and Probate Law Section). Trusts 101 at Estate Planning Basics, National Business Institute, May 2011. Community Service: Former Mayor, Amberley Village and Former Chair, Amberley Village Planning Commission and Board of Zoning Appeals. Board Member, Schilling School for Gifted Children.